Ages 18 & up; men and women. 2. The player with all the chips at the end is the winner or the player with the most chips after the five hour block will be considered the winner. 3. A standard 52-card deck will be used for 2-10 players each round. 4. The game requires a dealer (D), a small blind (SB), and a big blind (BB) player. 8. Players must make the best five-card poker hand by using any combination from the seven cards available. 9. Each player can use one, both, or neither of his/her 2 holecards to make his/her five-card poker hand. 10. The last player remaining with cards or the player with the winning hand is awarded the pot. Medaling is not division specific and will be awarded by gender and age categories only. 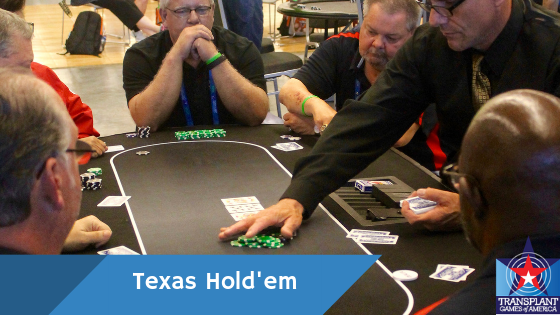 Once an event is completed and results are available, Texas Hold-em staff must record all competitors and times/scores to the appropriate system/documents. When electronic scoring is being utilized a manual backup system must be in place to record results.